Jonathan Bowman's View Of The Pan American Endurance Championship. On the first day of our journey, our truck pulled the 13,000+ pound, 36-foot horse trailer for 380 miles of our 1100-mile journey before deciding it wanted nothing to do with trip. We were planning on driving from our home in Shadow Hills and stopping in Davis, CA but now we HAD to stop there. We barely made it to Kate and Bob Tangren’s ranch, just outside of Davis, before the truck overheated. The truck and trailer were carrying my horse (Heigh Ho, AKA Kitt), horse gear, wife (Melody), kids (Morgan and Luke) and enough other stuff for us to live in the mountain forests of Trout Lake, Washington for 10 days. It turns out that a head bolt sheared off inside the engine and allowed all the engine coolant to leak out. Anybody ever hear of THAT happening before? Picture this, late Saturday afternoon we’re in the Dodge dealer showroom with both our cell phones going, frantically trying to find some way to get the family up to Washington with all our stuff (including my horse, of course). At the same time, I’m running around after our son (2 years old) who is more interested in hiding from me under the Dodge Viper than he is in my panicked state of anxiety (a tight fit, but he tried none-the-less). Melody called everyone she knew that still lived in Davis (UC Davis is our Alma Mater) and my brother was willing to have his truck upgraded to be able to accommodate the monster trailer, then deliver the truck to us from Paso Robles. The dealer said our truck could not be repaired until Tuesday afternoon, at the earliest. We supposed to arrive in Washington on Monday for the beginning of one of the most important races of my endurance-riding career: The Pan American Endurance Championships. The Pan American Games are a continental version of the Olympic Games which include the Olympic Program sports and others that are not part of the Olympics. They are meant to bring together athletes from the countries of the Americas in a festival of sport and international friendship. Usually, the Games are held every four years in the year preceding the Olympics. 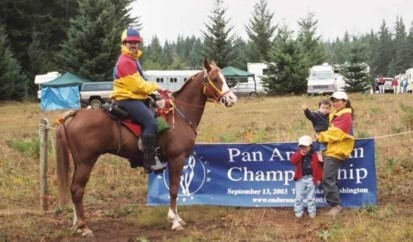 For endurance horse racing, which has no Olympic Event, the Pan Am Endurance Championship is a 100-mile, one-day race held every 2 years. Also, because there is no Olympic venue for the sport, this race included representatives from many countries outside of the Americas: Belgium, Denmark, Germany, Greece, Japan, New Zealand and Romania. They cannot win a medal in our continental race, but they can compete and gain international racing experience. Here is the simplified version of how it works for the USA; first you must become qualified by completing a certain number of 100-mile races and show that you can compete at a certain speed. Once you have earned a "Certificate of Capability" you can be nominated for a place on the squad of your region (5 regions in the US). Twelve horse and rider combinations are accepted to each squad (along with a number of alternates) and they all travel to the race site. The day before the race, the Chef d’Equipes (the team Bosses) selects 4 horses to represent the squad as the "scoring" team. The 3 top scores of that four-person team are then used to compute the team’s placement for the gold, silver or bronze team medals. So, after a grueling year of qualifying, nominating and being accepted onto the Squad representing the Pacific South Region of the United States, we were on our way to the race. So far, things were not looking too good. Becky Glaser, the Co-Chef d’Equipe, was an hour outside Davis on her way to Oregon when she received my frantic call. She turned back, located us at the McDonald’s next to the dealer and worked miracles. She found a neighbor of a friend who would be willing to loan us a truck to pull our mammoth trailer. Later that night I met Ray Bailey and Vicki Giles at their house in Lincoln, an hour from Davis. Vicki was an alternate for the Pacific North team and Ray said to me, "I would not loan this truck to my brother. HOWEVER, I know how important this race is up here, so I understand what you are going through. Here are the keys. Just let me finish changing the oil and wash it for you." Unbelievably, he took the time out of loading their trailer to CHANGE THE OIL. Thanks, Ray! OK, things are starting to look better. The next couple legs of the trip were rather uneventful. Except that without a crew cab, the kids were squashed up in the front with me: "Watch your leg Luke, I need to shift into 4th gear!" We stopped in Azalea, Oregon for the night on Sunday and met up with 2 other members of the team. We stayed on a 300-acre ranch with an ex-Californian endurance racer, Marty Ginsburg. She took really good care of us and helped smooth my frayed and rumpled nerves. (By the way, don’t try to pump your own gas in Oregon. It is against the law and I almost got a fine when I tried to fill my tanks!) Morgan fell in love with one of Marty’s dogs and was really upset about leaving him because, "he loves me so much and will miss me!!!" On Monday, we drove our three rigs in caravan up to Base camp. Melody got out of the trailer and rode up front with Jeff Townsend in his rig. When we got there, we set up in the . . . RAIN! It proceeded to rain/mist/fog/piss through Thursday. During that time, I was involved in numerous meetings, taking care of various race-related issues, getting my horse out for exercise and practicing showing him for the Vet Checks. Melody and the kids stayed mostly in the 12-foot living quarters of the horse trailer getting "trailer fever" for 3.5 days. Actually, the kids probably enjoyed the attention, reading, playing games and watching videos all day, but I think Melody was ready to explode. Even when she did get a minute to herself, there was not much to do in the rain and mud. Finally, Thursday came and my crew arrived: Tara (my groom) Craig and Danielle. The sun finally came out just before the opening ceremonies began. Tara and I put on our parade clothes and marched with the horses past bleachers filled with people cheering as the Olympic theme played over loudspeakers. Melody ran ahead with the kids in our large, red, off-road, double jog-stroller to take pictures and videos. It was a pretty powerful and emotional moment made even more so as the horns hit a crescendo as we passed the loud speaker. Kitt tried to jump into my boots! On Friday, the race preparations began in earnest. Endurance riding involves a horse and rider team competing on a set course of up to 100 miles as quickly as possible. Riders aim to finish the course with a "sound" horse. There are multiple veterinarian checks along the course, including one before the ride, at which the horses receive a full soundness exam to ensure that they are fit to start. The Vets also check metabolic signs like pulse, respiration, hydration and "gut sounds". There were five such checks at this race. The horses that pass the pre-ride check are then cleared to ride Saturday. There are inevitably some horses that will not pass. I got one of the best vets in the country, who is also the president of the AERC (American Endurance Ride Conference - the national governing body for long distance riding). He said that Kitt looked the best of the last 15 horses he had seen - good kudos. Next, the riders and tack had to be weighed. The minimum weight requirement is 165 lbs. This is good for me, because I am well over that without my saddle (or clothes, for that matter!) I weighed in at 216 lbs which makes me about 50 lbs heavier than many. At least I don’t have to ride with extra lead in my saddle - I have it in my lead-bottom. After the pre-ride vet check, the Chef d’Equipe asked me to come with her to Command Central (an old, large motor home). I felt like I was being called into the principal’s office for a scolding. I knew this was irrational, but had to resist the urge to bolt. Inside, the other Co and Assistant -Chef d’Equipes were waiting and looking solemn. "Hi. How are you? Please sit down" niceties followed. Hmm, what did I do, whom did I upset this time? "We are considering you for the team," Becky began, "we feel that you could be the bedrock upon which our team will be based. However, we have had some concerns and complaints about the big red stroller. It’s scaring some of the horses." At this point I am reeling - I did not register much after "considering you for the team." When I began to feel the ‘80s upholstery again, I stifled a laugh and told them that it would not be a problem; we’ll keep the red monster away from our horses (but started thinking, maybe we should run through some of the other camps with it?) I left knowing that of our squad’s dozen extremely talented, experienced and athletically fit horses they had chosen Kitt for a place on the 4-person team. An unbelievable honor, Kitt has really made it into the big time. At the meeting, they announced who was on the team and there were some disappointed people. I felt badly for them, for they all have such wonderful horses (but not too badly). After talking/planning with my crew, I retired to the trailer for the requisite night hours of not sleeping and awaited morning. The trial begins in the Gifford Pinchot National Forest and traverses the base of Mt. Adams, often opening up to stunning views of the mountain, Trout Lake Valley and Glenwood Valley. There are a number of places where you can see both Mt. Adams and Mt. Hood. (I tried to picture my dad doing a handstand on the top of Mt Hood, and almost ran into a tree - but that’s a story for another time.) Mostly, the trail winds through the ponderosa pine forest with excellent footing with the abundant smells and sounds of the forest. At 6 AM Saturday morning, it was still dark and of the ~100 horses that were in Trout Lake to compete, 89 were starting. Even at this early hour, there was quite a crowd cheering on their favorite country, team and riders. The excitement was palpable in the air and the horses could definitely sense it. They stamped, pranced, spun and snorted. The countdown came and off we went in a cloud of dust and a thunderous cheer that sounded like a thousand voices (but was probably less than 100). The first loop was 20 miles and wound in and out of the woods. We passed by the "Big Tree" (one the largest known Ponderosa Pines), but we zoomed by it now because we had stopped to see it earlier in the week. It SURE IS a really big tree. The first Vet check was back in Base camp and was already a madhouse when we arrived. It was actually pretty sane, but I was high on adrenaline and worried about passing the stringent examination that is done at this international level. My crew met me and took care of Kitt, while I got my bearings. (The stroller was well off to the side, away from the horses. Good work Mel.) When you come into a Vet check, you are not allowed to approach the Vet until your horse’s pulse has come down to a certain level. If the horse is not at criteria (64 beats per minute) you are penalized 30 minutes. Kitt was down immediately below 60 BPM and our team Vet OK’d him to go into the check. At the demonstration ride, Kitt had developed a little back soreness. Here, he passed all the checks with no problem - time to move on. Thank goodness for the new endurance pad from EquiPedic. It was working great. I learned at that Vet check, not to worry so much - this was not that different from the races I had done in the past. As we are getting ready to leave, my crew is there to help. Craig pours some water on Kitt’s neck and the one of the Ground Jury says that he is not allowed to crew here. I apologized and said it would not happen again. Very stoically he replied, "I know it won’t." I know, I know, just doing his job, but . . . phew. The second loop was also 20 miles, winding through the forest again. This loop incorporates two of the biggest climbs in the ride. The climbs occur relatively early in the loop with the rest of the loop descending (actually, up and down - but mostly down) into the next Vet check. Kitt and I have a good working relationship; he carries me up the hills and I get off and run down. I ran at least half of this loop and was starting to feel it a bit when we reached Pipeline, the second check. As I come out of the trees I see a very small, crowded, gravel filled parking lot with ~40 horses in various stages of resting, eating and vetting. Kitt’s pulse is down, he munches a bit and off we go to the vet. As we round a stand of trees and head into the vetting area with the Chef d’Equipe (one official from your team must always accompany you to the vet as you are not allowed to speak to the Vet), I am cheered to see Mel with the Red Monster coming towards us. Unfortunately, in the official’s opinion, she is too close and gets shooed away. Kitt passes the checks easily, although he is shivering a little in the cool shade. We get him back to our team’s area, warm him up and let him eat. We had ridden much of these 40 miles with Tammy Robinson and her horse Sharkee, who was also selected for the team. At this point Sharkee is not acting normal and Tammy is concerned. Our time to go has arrived: a good-bye to Mel, my crew and the Red Monster with Morgan and Luke and are off. The third loop is 21 miles long and we navigate it pretty easily. However, we are riding alone and I sense that Kitt is getting tired. So far, he has traveled 61 miles, mostly with me on his back. I have probably run about 15 miles. Again, at the Vet check, my crew is there to meet me with horse blankets and water. Here, I find out that all 3 of the other members of my team have been pulled; Sharkee did not make it out of the last Vet check and the other 2 were pulled here. To be in the running for a team medal, you need to have at least 3 horses finish, so this effectively eliminated us from that. It also eliminated a certain amount of pressure on me. Next, I hear that over 20 horses have been pulled at this Vet check. Time to worry again. We’ve moved from around 70th place to somewhere in the 50’s. Kitt’s heart rate is down and off we go to the vet. He does seem to be tiring and the Vet says that his gut sounds are low. He wants me to bring him back just before we leave to have another look at him. I’m not terribly concerned (yeah, right) because he is eating and drinking very well. At the re-check, they say he sounds much better and states that we can go on. As I head out on the next 15-mile loop, we pass some riders coming into the Vet check. I ask how the trail is and most say that it is mostly hills. Great. It turns out not to be too bad, but we are riding alone and we’re both lacking motivation. On our way down, we catch up to a rider from New Zealand, Madonna Harris. I get off and jog half of this loop on the way back down the hill and chat with Madonna. We stopped about a mile from the vet check to let the horses graze and get their guts moving before heading into the check. By the time we get there, she and I are friends and so are our horses. We agree to wait for each other so that we can leave together. Everything goes fine at this vet check and I feel as if we worried for no reason about how tough the vets were going to be. I again learn that more horses were pulled at this check also - so I made mental note to continue to worry. As Kitt and I were resting and eating, I told Melody about Madonna from New Zealand. She looked at me strangely and said, "Ask her if she used to bike race." (Melody raced internationally for about 8 years). Turns out that they did race together 15 years ago and both remembered each other - big hugs all around. Just another example of how the world getting smaller as our experiences get larger. We left together as the sunlight was waning, about 7:30. We had 11 miles to go to get back to Base camp, where the last vet check was before the final 13-mile loop. Madonna had this humongous headlamp on her helmet and it lit up the entire area. I have never ridden with a lamp before and was skeptical of its use here. However, because of the trees, roots and technical winding of the trail, I grew to like it and relied on it. It took us over 2 hours to do this loop because we were being very careful in the dark. At this point, with no team pressure, I just wanted to finish with a healthy horse. At the vet check, our team crewing area was empty, a third of our squad was ahead of us, a third behind and a third had been pulled. Because of this, we were able to get a lot of attention and had room to relax. No problems here, we slid through the check without hesitation. Our team vet said that he looked slightly off and that we should be careful. By now, it was very dark out and when we got back into the forest the star and moonlight were completely absorbed by the trees. At this race, we had to bring Kitt back for a health check after 2 hours. This meant that I went to sleep around 3 AM. I guess I’m getting old, but that felt really late to me. After sleeping slightly, we woke to another sunny day and went to watch the Best Condition Judging of the top ten finishers at 9 AM. Some looked better than others, but all looked ridden. I was pleased to see that none looked better than Kitt (rightly so, they finished more than 5 hours before us!). The closing ceremonies were in the early afternoon, so we came back and got gussied-up again. The entire squad assembled behind our camp, but only the horses that completed were allowed to participate in the ceremonies. As we approached the stands, the horns of the Olympic theme again blared from the speakers. I could not keep the tears from flowing. In them was reflected what we had all been through: my horse, my family, my crew and me. It had truly been an epic journey that had stretched the fiber of all of my relationships. As my groom Tara and horse paraded next to me, with Melody, the kids, Craig and Dani watching, I hoped that the rigors of this journey had not stretched these relationships too far and believed them to be strongly elastic and would not break. Two weeks after we arrived home, Melody said that we had received a card from Ray and Vicki. You see, while mulling through the rain and boredom in Washington, Mel had arranged to have our truck repaired. Back in Davis after the race, we paid a small fortune to retrieve our truck on Tuesday morning. We then headed up to Lincoln to return Ray’s truck. On the way, we stopped and bought them some cookies and a card. Into the card, we slid a $100 bill - our thinking was that it would be a good way to say thank you and help defray the cost of the wear and tear that a 1500-mile trip like this could do to a truck. The card from Ray and Vicki two weeks later had a note that said, "Thank you for the cookies and NO thank you for the money. That is not what we intended when we loaned the truck." In the card with the note was the $100 bill. Our journey has now truly ended; the trailer is parked in the driveway and unloaded, Kitt is in his arena and still looking good and we have some wonderful new friends and incredible experiences that will last a lifetime. 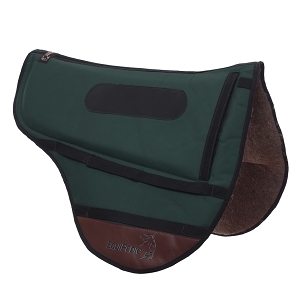 For information or to order EquiPedic Saddle Pads, call EquiPedic at 505-523-0900; fax 505-526-7957; send e-mail to rsacks@equipedic.com; or see the Web site at www.equipedic.com.